Hall of the Mountain King: Review: Jorn, "Dio"
What you will hear are some deep cuts from Dio’s lesser-known records that you likely wouldn’t expect. There’s “Push” from 2002’s “Killing the Dragon,” “Lord of the Last Day” from 2000’s “Magica” and “Sunset Superman” and “Night People” from 1987’s “Dream Evil.” All performed with just as much reverence and gusto as any of the better-known songs. Among the best of a group of outstanding performances is his soulful rendition of “Shame on the Night” from “Holy Diver” and the dark, exotic “Lord of the Last Day” from “Magica,” which is a record that I think gets too often overlooked in the Dio catalog. Fittingly, Jorn doesn’t mess around with the arrangements and, aside from a few small flourishes here and there, delivers them as they should be. You can’t improve the songs, so don’t mess with them. 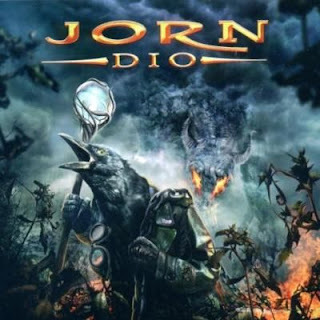 The one non-Dio song here is Jorn’s personal tribute to the legend, “Song for Ronnie James.” Obviously, it’s the weakest link among this crop of songs, but looking at the competition on this record, that certainly doesn’t mean it’s a weak song. Admittedly, I think it gets a bit melodramatic in places and goes just a little too long at eight minutes, but I certainly can’t disagree with the sentiment or the statement. On a side note, Jorn has been chosen as one of two singers (the other being Glenn Hughes) to perform with the remaining members of Black Sabbath/Heaven and Hell as they pay tribute to Dio in London on July 24. After hearing the songs here, I certainly wish I could be there to see it.